The weekend forecast for the top half of the North Island really wasn't looking too flash I'd have to admit, but as this reporter drove south from Auckland expecting to be setting the course up in torrential rain on the Friday afternoon we pulled ahead of the rain and arrived in Taupo to an overcast but fine afternoon. By 4 o'clock the baskets were out and the tee's all marked. That evening watching the Warriors play in Auckland and The Chiefs play in Hamilton both in torrential rain I had a feeling the worst of it would hopefully go through Taupo over night, and that's exactly what happened. I woke numerous times over night to hear the sound of solid rain on the roof but by morning it was still, with just the occasional light shower that disappeared by mid morning. How lucky were we? The 45 starters all made the most of the reasonably still conditions for the opening round with Jackson Sullivan and David Keene coming in with 49's [7 under the card]. They were joined in the afternoon seeded top card by Master Siep van Vliet and SGM Bob Gentil both on 53's. The afternoon round was played in beautiful shorts and tee shirt conditions and the scoring was consistent from most players with the evergreen Simon Feasey matching Speedo & Jacko's 49 from the morning. Jackson carded a 50 in the afternoon to maintain his lead by 3 shots going into the final full round Sunday morning. As the groups headed for their starting holes Sunday morning the weather came to the party. 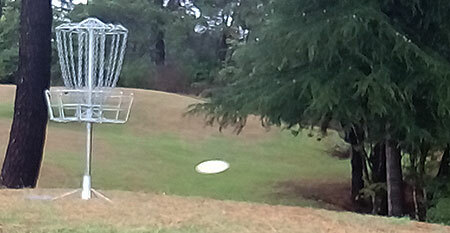 It was overcast but still ideal condies for a hot round and that's exactly what Jacko shot. 12 birdies and 1 bogey, a 45 (11 Under) to smash the course record by 3 shots. The 'Super 6' was going to be a race for the minor placings. 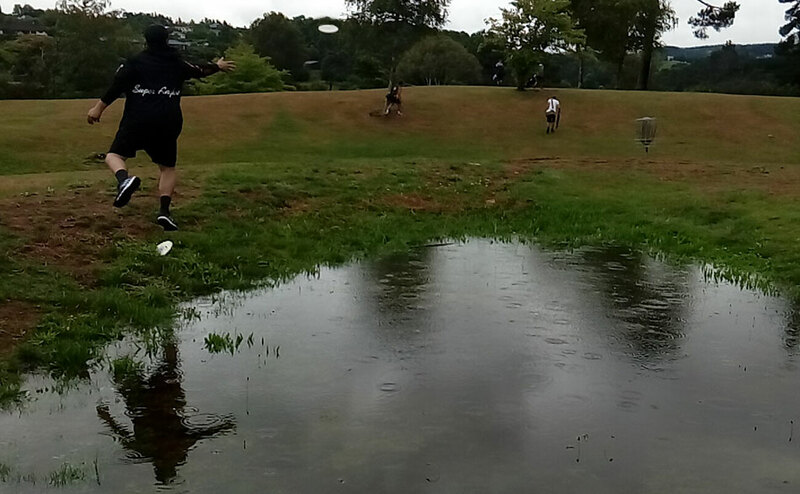 To those that pulled the plug as they thought the weather was going to be bad, you missed a great weekend of Disc Golf in pretty good conditions. To those that came and played, including 3 junior brothers from Auckland thanks for making it yet another memorable weekend. 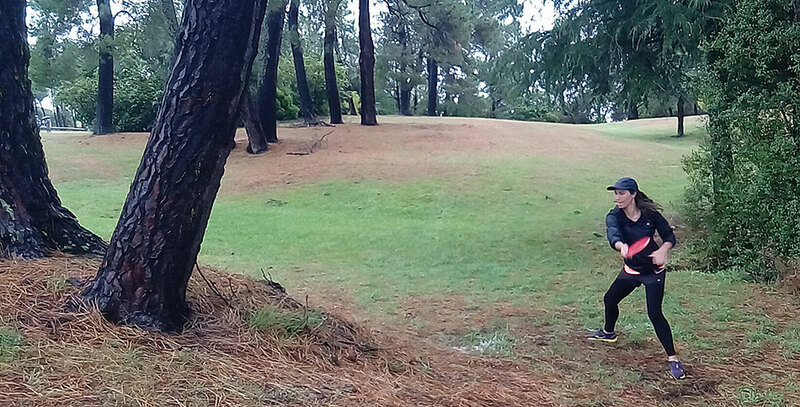 Eye of the Pine Needle - Wellington Golfer Jake Moka sends his put at the chains in 17. Self Caddying - Moe goes for the dry putt approach. Easy Does It - Martin makes the tricky downhill putt on 18. Risky Run - Not quite Autumn colours yet as Lawton Williams tries for a tricky birdie on 2. Feeling a Prick - Ouch, yeek! German golfer Martin Doerken finds himself in the blackberry. Crouch, Engage, Birdie - They know how to deal with this situation in the Waitakere Ranges. Damian Peters slams his putt into the chains on Super 6 hole 3. 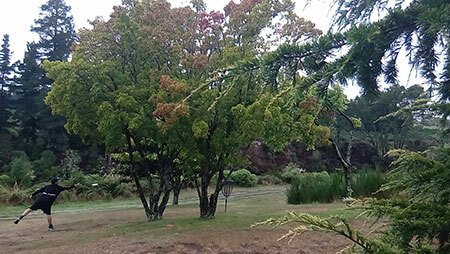 Volcanically Plateauing - From up the road in Rotorua, Logan Papuni played his usual consistent golf. I See Red - The very colour coordinated Martin Galley from Wanaka a regular here in Taupo. Stepping Up and Through - Wanaka Frisbee Gal Robyn Agnew is another regular sight at the Taupo Classic. Impressive Driving - Some great drives saw basket 15 under threat of an Ace as acheived by Lose Leftie Martin DV Haas once. Comfortably Numb - By late morning it was t-shirt and shorts weather. Jake Moka can attest to that. 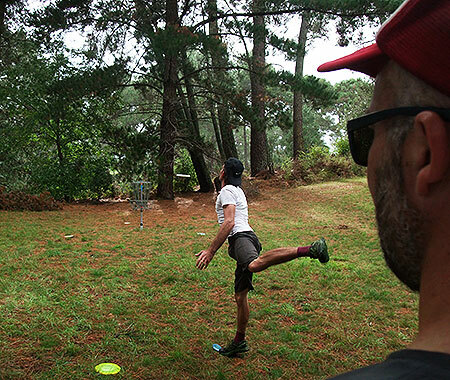 Balanced Act - Moe checks out Siep's style on #7. Timing It - West Auckland golfer Simon Feasey was playing catch-up all weekend. Grin or Grimace? - The battle of the 'grins'. The Line Up - The 2017 Taupo Classic Super 6 / 8. 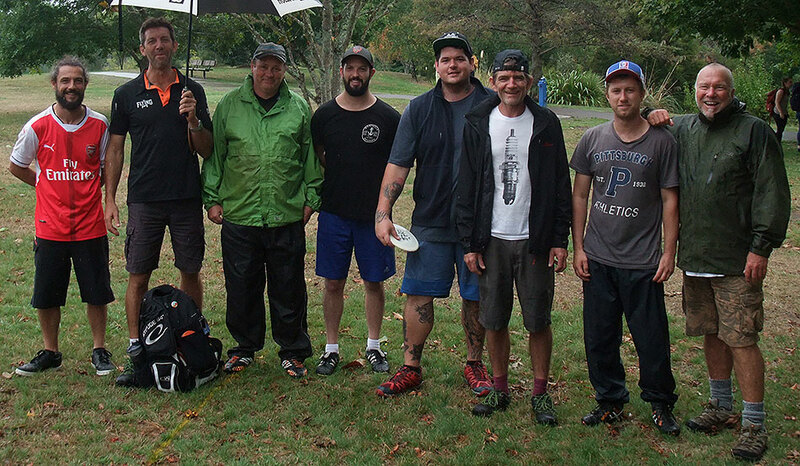 Damian Peters, Simon Feasey, Blair Joines, Davis Keene, Jacko Sullivan, Siep Van Vliet, Logan Papuni & the GM. Galleria - Even the odd shower didn't put too many off following the Super 6 round. "Toller Schuss mein Freund" - Hole 9 - alongside the batural thermal pools that have relieved many a golfer - and Moe admires the throwing technique of his fellow German Moe. The Roots - The Taupo course features many opportunities to watch other groups play - here Moe takes in Siep's drive on hole 8 as he waits to complete his birdie on 6. 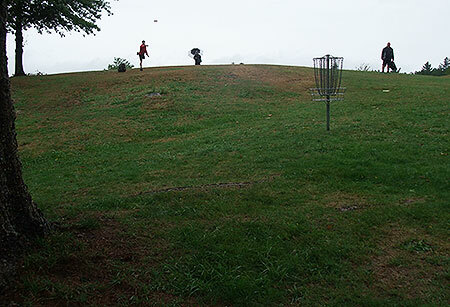 Risk/Reward - Lawton Williams takes on the precarious basket of Hole 5 despite having just shared multiple stories about round-crushing rollers to the bottom of the hill. 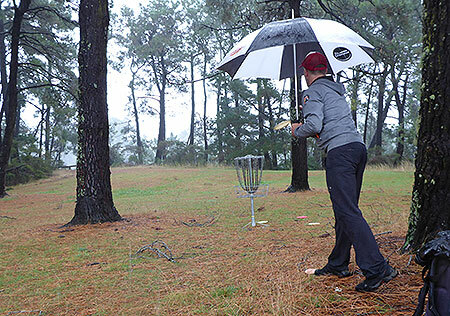 Here he did fly past the chains but fortunately sat up for a return up-putt. 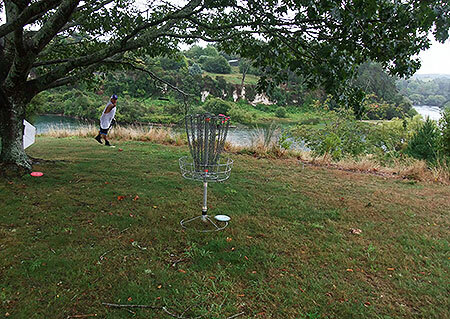 Letting Loose - Hole 8 entices players to really let loose - if they care to risk the fade/shank. Here Jack throws with vigor. Most Improved - Levin's Paula Wilson has been on the Tour for a few years now and appears to be showing that some of the skills per partner Jacko possesses has rubbed off on her. A well controlled 67 in the first round was nothing compared to her excellent 57 in the second. Reflective - Recovering from an injury which procluded him from defending his National title, Moe tucks one onto the green on the first. Leaping Lawtie - As the ripples of rain drops scatter across a watery bunker on the long fifth, Lawton Williams adds some bounce to his approach. 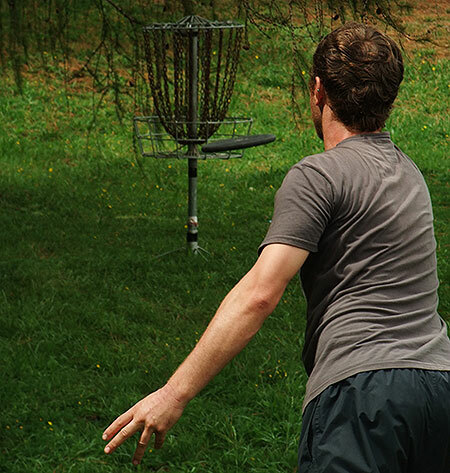 Och Aye - Scottish Disc Golfer Ben Thomson steps into his drive on Hole 7. 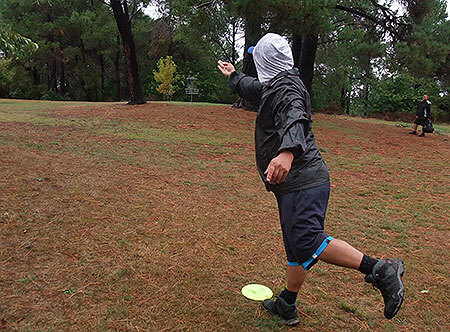 Rolly Polly - Many golfers elected to send their disc rolling up towards the heavily protected 7th basket like Moe here with his patent pending Long Trouser Overarm. Tree Fellas - Recent logging required some changes to the traditional course at Spa Park. 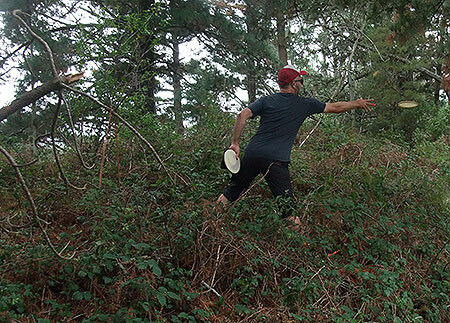 This delightful tee placement will develop to be even more tricky in the future as Moe keeps his disc high enough to avoid the post-logging weeds. 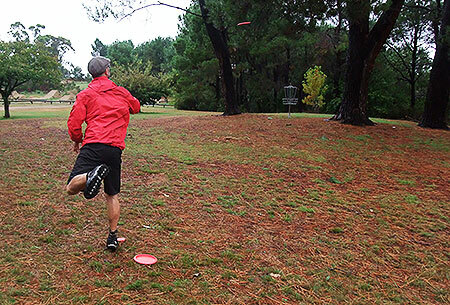 Like Son, Like Father - The light showers on the Saturday morning weren't enough to putt Levin Brotherhood's Shane Sullivan off. Write On - Upper Hutt golfer Jake Moka gets the scores down. 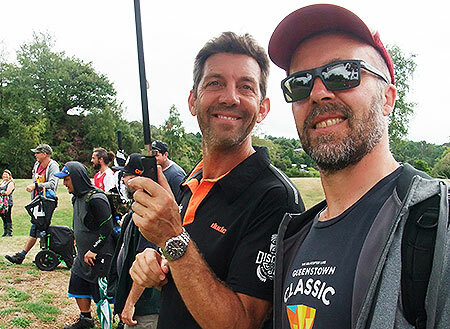 Back in Control - Damian Peters, back on tour and playing some impressive Disc Golf. Record Breaking - The Champ, Jacko Sullivan on his way to eclipsing the course record by 3 shots as it drops from 48 to 45. 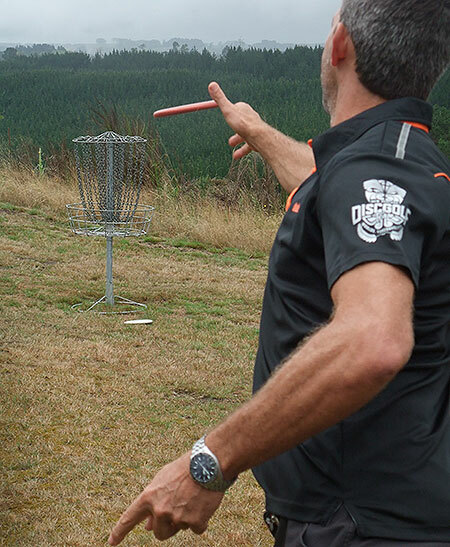 Thermal Thrower - Rotorua golfer Logan Papuni was loving the power throwing on the extended Super 6. 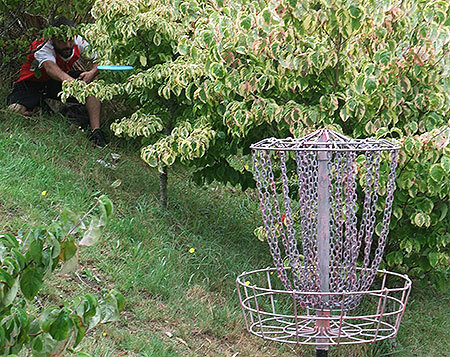 Effective Leftive - Auckland golfer David Keene slams a downhill putt into the chains.